The TDL Mounting Base comes complete with mounting fixings and label holders, which makes installation and labelling of the inputs and outputs easy. 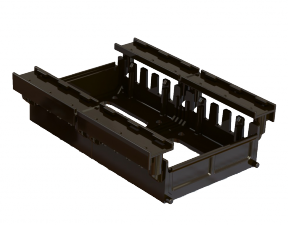 The TDL Mounting Base also acts as your cable trunking to conceal all of the input and output cables. Once the label holders are installed there is no sign of the cables or wiring which makes it a very neat installation and from an installation time very quick. For labelling, all you need to do is type up your list of inputs and outputs on an A4 sheet of paper then guillotine them into 12mm strips. These can then be inserted into the label holder which makes for a very tidy installation. You can install standard trunking either side of the TDL Mounting Base to accommodate any extra wiring required and still conceal the cabling. The TDL Mounting Base comes complete with mounting fixings and label holders, which makes installation and labeling of the inputs and outputs easy. For labeling, all that you need to do is type up your list of inputs and outputs on an A4 sheet of paper then guillotine them into 12mm strips. These can then be inserted into the label holder which makes for a vary tidy installation.